Beet It | Food E.
I know, I know… I am SO punny. No one has ever made this joke before. Anyway. Beets! They are beautiful in color and phenomenal in texture. If you’ve ever had a bad borsht experience, maybe you’re scared of them. As a kid I vividly remember frozen Tupperware full of hot pink soup and I never, EVER wanted to taste that terrifying liquid. But I have moved on. Grown up. You know. Most beets are boiled, broiled, sauteed, or roasted and while they are delicious cooked up, they are also phenomenal raw. Just be aware: your hands will turn a lovely shade of magenta if you work with them bare-skinned. 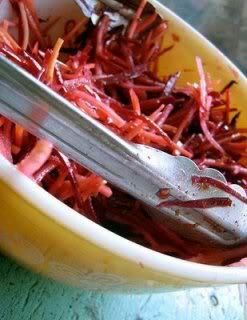 Peel beets and carrots, and then use a potato peeler to shave them into long strips. Mince the shallot and add to beets and carrots. Toss with mustard, olive oil, vinegar, and salt and pepper. Chill before serving. *Please note: due to technical difficulties (seriously, the story of my life this week) the picture above is not of the crispy, tangy salad I myself created and enjoyed. Using my recipe above, your salad will be “earthier” looking than the one in the picture. Go with it, friends.